If you log in to Ask.com, you can see a link titled AskEraser as shown in the photo below appear on the right top corner of the website. Once you click on the link, a small message will prompt out and ask you whether you want to turn on AskEraser. The ASkEraser function will be activated once you click on to the “Turn On AskEraser” button. 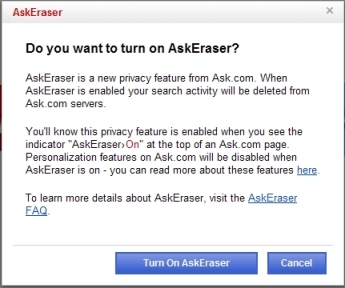 The AskEraser will delete all subsequent search queries, cookies, users’ information, etc from their computers. As internet privacy is a serious argument and issue nowadays, the measure to delete the private search queries will gain greater popularity in the long run. The opportunity to stake out private space on the Web becomes more critical as Internet use grows more deeply embedded into daily life and as Web sites and advertisers seek information on user behavior to send them targeted messages.